Let’s think more like George Lucas. In 1973, he wanted to make a sci-fi movie, but Hollywood studios weren’t big fans of science fiction. So George negotiated a deal with 20th Century Fox to forgo up-front payment for his services on Star Wars. In exchange, he retained the sequel rights (and eventually merchandising rights). What if … we think about our content marketing like George Lucas did about Star Wars? That’s what I asked over 3,500 marketers at Content Marketing World 2017 to do during their week in Cleveland – to think differently about how to get things done and to envision a unique path to success for them and their companies. Throughout CMWorld, hundreds of presenters shared how to build that path brick by brick and some shared their own panoramic view. Here are just a few who shared what happened when they asked their own what-if questions. What if … we look for unexpected audiences? As a 125-year-old company, GE is old. How does it tell a fresh story to attract new audiences while remaining true to the brand? A delicious idea called the GE Barbecue Laboratory. CMO Linda Boff shared how GE chose to lean into the behavior of millennials and attend the hip South by Southwest event in Austin, Texas. The Barbecue Laboratory included a 12-foot super smoker created with the help of GE data scientists to ensure that the brisket came out right every time. Laboratory subjects also could test how their brains reacted to different flavors of barbecue. The lab now travels to college campuses to give the next generation a current taste of a century-old brand. What if … our audience tells our brand story? To show the power of that idea, Kate played this video from #ShareaCoke created by two customers in 2014 to share their big news. Through Coca-Cola’s Share a Coke campaign, these parents-to-be incorporated the beverage cans into their big announcement. “I couldn’t have written a better script if I tried,” Kate said. Today, that video has over 4.5 million views (living on a third party’s YouTube channel), has earned tons of media coverage for Coca-Cola, and has inspired countless people to #ShareaCoke in a creative way. That’s what can happen when you build a creative framework to enable your audience to tell their story through your brand. What if … we pay more attention to our customers than our industry? CMWorld listened to its customers and asked 2016’s most highly rated speaker, Jay Acunzo, to be a keynote speaker this year. And Jay offered a couple great stories about the power of paying attention to your audience. Mike Brown owned a small coffee shop in Saratoga Springs, New York. He listened to the industry and roasted Arabica beans, which are used in over 75% of the coffee sold in the world. He learned, though, that his groggy customers didn’t care what beans he used, they wanted really strong coffee. 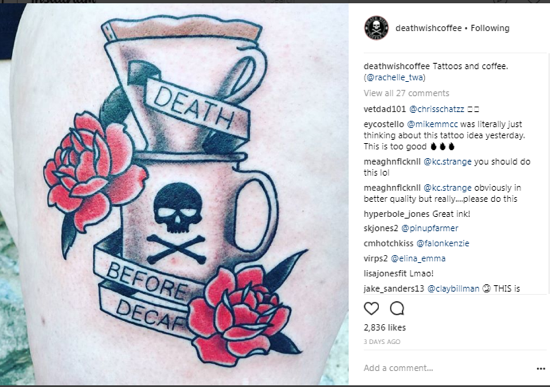 He ultimately chose the other kind of coffee bean, robusta, to brew the strongest coffee in the world and Death Wish Coffee was born. The brand won a 30-second ad spot during the 2015 Super Bowl through Intuit’s Small Business Big Game competition, and the customers followed. They are committed to the Death Wish brand, even tattooing the logo on their bodies. Or take another example shared by Jay – Merriam Webster. Yep, the dictionary people. Words and their definitions are boring to most people. That is until the marketing team used its social media channels to define the hot dog as a sandwich. The “internet” aka “audience” lost its mind. “The brand took a stance and the audience took a stance right back,” Jay said. What if … the story was more important than the brand? 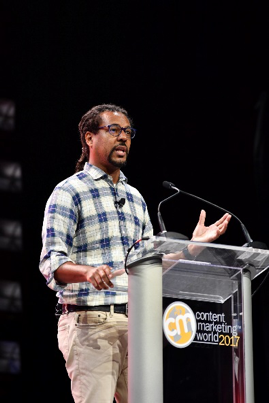 Pulitzer Prize winner Colson Whitehead has moments when he realizes he’s reached a new place as a writer – subverting plot conventions, forgoing digressive excess, etc. While Colson leverages the narrative tools that best suit his personality as an artist, he never does it at the expense of the story. Colson’s takeaway for his own writing can be extended to brands. Too often, you or your team may become enamored with the shiny objects – new platforms, techniques, technology, etc. But your audience doesn’t care about those things like you do. What if … we listened to our audience, not just their data? Wil Reynolds of Seer Interactive had an interesting twist in his presentation around analytics. He played two recordings of people searching a topic on Google. You read that right – real people talking through a search, explaining what they’re looking for, and detailing why they clicked (and why they may have had to return to the SERP to find a better result). By interacting with people in their natural environment, you can see and hear what the data can’t tell you. I don’t think Wil’s advice should be limited to search – talk to your audience, observe your audience, and listen to what your audience is (and isn’t) saying. That’s how to ensure that your work resonates. What if … we grow a community not just to connect but also to create? Though Joseph Gordon Levitt is more famous for his acting, his shining star is the creation of HitRecord.org, a project he began to let people go beyond connecting online to actually creating together. Originally an online bulletin board, Hit Record became a professional open collaboration production company in 2010. Each finished work has been touched by many contributors who are part of a single community. If that work is sold, all community members who had a hand in its creation get fairly paid. “That’s the kind of creativity the internet has the potential to do,” Joseph said. I think that’s the kind of creativity your company has the potential to do too – harness the power of your audience. What if … our audience can be our brand’s most valuable asset? Not that long ago, the only companies that saw value in audiences were media companies. By creating content, they attracted readers, listeners, and viewers, which in turn attracted companies to pay to advertise to those audiences. Today that business model is not reserved for media companies. “We are all in the audience business,” Robert says. The lines between a media company and a brand haven’t just blurred, they’re gone. And media companies are selling products. BuzzFeed turned its viral Tasty video recipes brand into a revenue generator when it sold custom hard-copy cookbooks. But it didn’t stop with traditional media products. This year, the Tasty brand partnered with GE to create and sell a $150 Bluetooth-connected hotplate. Yes, BuzzFeed is in the hotplate business. I could go on with example after example of companies, but instead I’ll leave you with a finding from our soon-to-be-released 2018 research and two questions. In the most successful B2B content marketing programs, 92% are focused on building audiences. Of the least successful brands, less than two-thirds (65%) are focused on building audiences. What if you and your team viewed great content creation as the key to building and growing your brand’s audience? And what if that audience becomes your company’s biggest asset? In 2011, I asked, “What if we had a content marketing conference that drew 150 people?” That first Content Marketing World blew away my expectations and that was only the beginning of imagining and realizing the possibilities of the audience. Thanks to all of you – every attendee, speaker, exhibitor, sponsor, staff member, etc. – who made Content Marketing World 2017 possible. 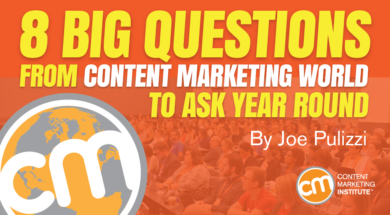 What if you could watch hundreds of presentations from Content Marketing World? How would that inspire and help you to improve your content marketing program? Find out. Subscribe to CMWorld video on demand today.